Yeah, I know I’m incredibly late with this. But I finally played Device 6 and can’t get over how great it is. I added it to my top 25 games list, so I thought I should write a review to explain my decision. I have a lot to say about it that would spoil things, so I’m going to try to keep it spoiler-free at first, then delve deeper into the details further down. 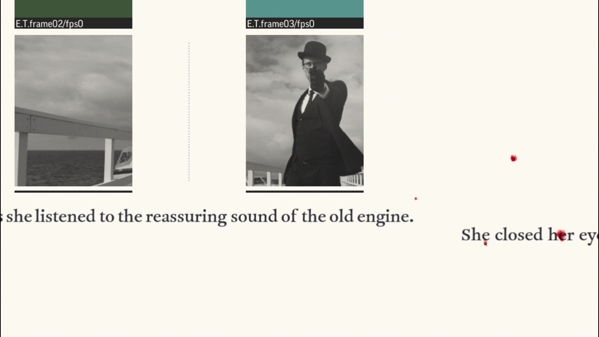 Broken down to its very basics, Device 6 is interactive fiction in which you need to solve puzzles in order to unlock each chapter. I know it doesn’t sound like much, and perhaps that’s why it took me so long to finally play it. But the game is so clever and so masterfully done, that I would recommend it to anyone looking for a unique experience. 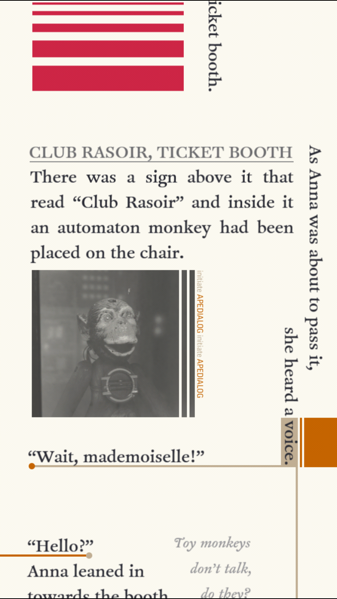 It is a text adventure with clues hidden throughout that you need to find and decipher in order to solve puzzles. It’s broken up into several chapters that are all part of the same story. But each chapter is self-contained in regards to its puzzles. This works extraordinarily well. To be clear, it’s not a choose-your-own-adventure game. It might have the appearance of one, but there doesn’t seem to be any way to mess up. The story starts with a young woman, Anna, waking up in a strange room on a strange island with no recollection of how she got there. But she’s not the type of person to just sit around and wait for someone to save her, so she sets out to figure out where she is and how she can get back home. It’s a spy thriller, a mystery, a modern Alice in Wonderland all rolled into one. And it’s so much more than that. You’re not so much playing as Anna as watching her and guiding her. You’re both observer and participant, but even that may just be a fabrication. The way the game is presented, it’s hard to know what’s real. Visually, the game is stylish and modern, very minimalistic. 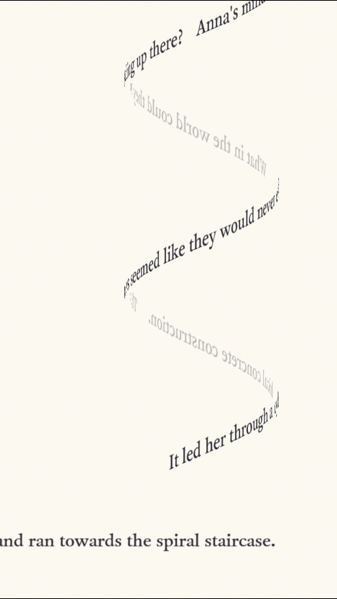 Words bend and twist and form shapes to aid in the storytelling. Throughout the game, you’ll find yourself turning your device over and over to follow along. For this reason, I preferred playing on my iPhone, even though I started on my iPad first. 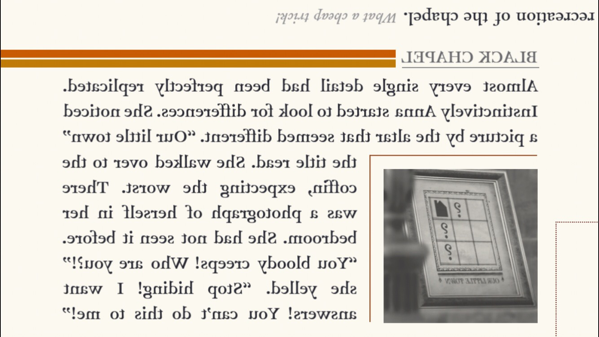 The iPad offers a larger screen for easier reading, but I found it a little clumsy for all the rotating. Also, playing on my iPhone meant I could take it with me, of course. The game features all sorts of mixed media to keep it interesting. Besides text, there are photos, music, sound effects, spoken word audio. Even the “buttons” are stylish. And there’s this wonderful parallax effect that breathes life into the photos. 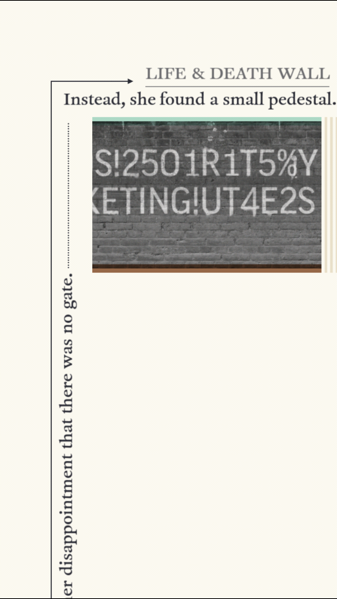 In Device 6, the words become art. They form a ladder or a bridge, even a staircase. But never in a way that feels forced. Occasionally, I had to re-read paragraphs because I got distracted by the layout. But that usually just meant clearing my head and focusing on the words, despite all the distractions. Intentional or not, I found this to be a bit of an allegory for how today’s technology affects us. 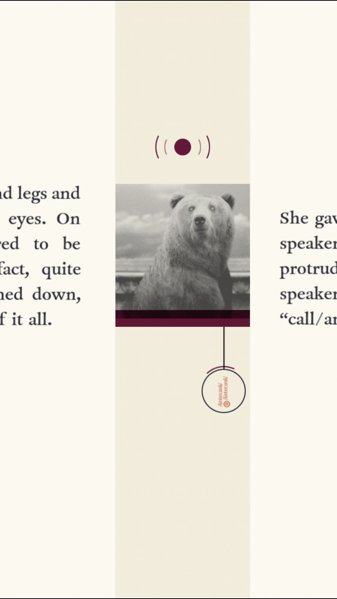 I used to carry a novel around with me everywhere — until I got my iPhone. Now it’s been months since I last sat through a book. Every time I start one, my iPhone beckons to me with its infinite possibilities. 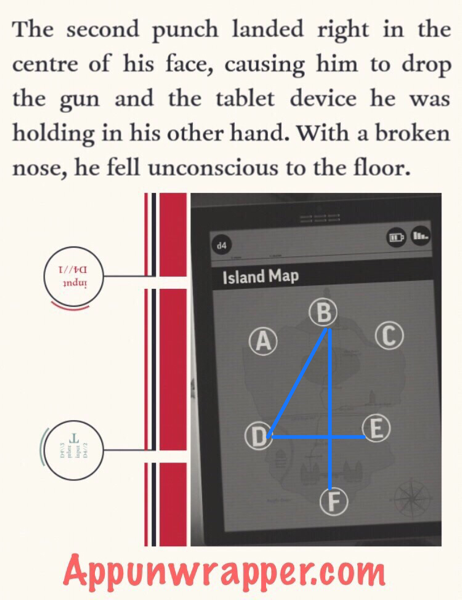 Perhaps games like Device 6 are the future of novels? 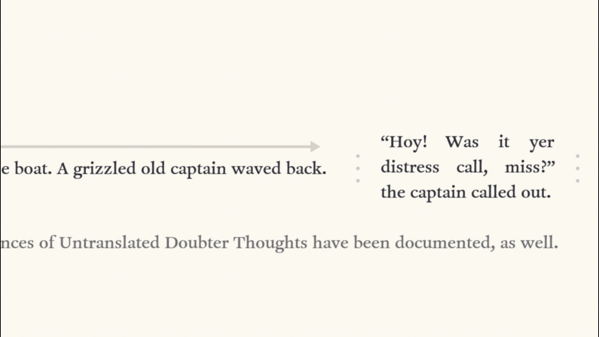 Something that can both distract and hold a reader’s attention more than simple words on a page? 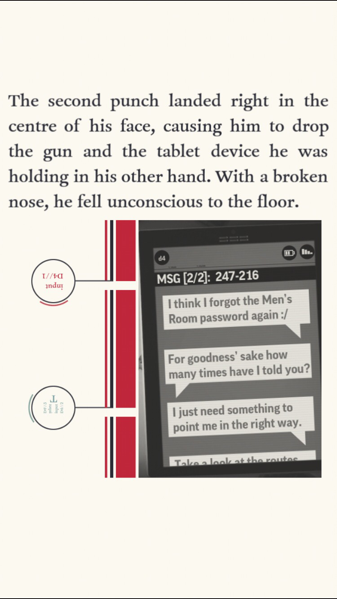 With Device 6, the distractions came from within the content, instead of outside of it. I think that’s also part of the reason it took me so long to finally play it, even though I installed it and deleted it from my devices several times in the last year. It’s something that demands your attention while distracting you at the same time. The game tells you at the very beginning that it won’t work without sound. It seems at first like this might just be a coy way for the developers to tell you that you’d be missing out if you play on mute, but it’s not. While technically the game will run on mute, you won’t be able to progress without the sound on. This is because many clues are given through audio clips. Much of the game has you seeing or hearing things that don’t make any sense until later. It’s a formula, sure, but it’s a formula that works. You can read through the story normally, knowing that when it comes time to solve a puzzle, you can go back and find the clues. You don’t need to worry about something that doesn’t make sense until it comes time to make sense of it. It’s a smart game that doesn’t talk down to the player. Some of the clues and puzzle answers are more obvious than others, but everything is logical. Like many of the best puzzles out there, I was often stumped, but felt silly once I figured out the answer. It really is a brilliant game. While I really liked Simogo’s earlier game, Year Walk, I found some of the puzzles unintuitive, requiring more guesswork and simply playing around with things to see what happens. But with Device 6, everything is logical. I never felt like a puzzle was unfair. If it took me a particularly long time to solve, it was simply because I was overthinking it or not thinking about it in the right way. But I always had that “d’oh!” moment when I finally figured it out. 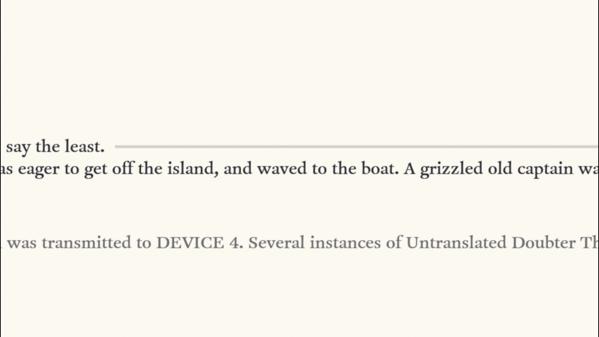 I love the playful tone of Device 6. Even though it seems something sinister is lurking in the shadows, it’s still very light-hearted. I often felt that the game was mocking me and my inferior intelligence. But all in good fun. The story reads a lot like a modern version of Alice in Wonderland, what with the woman waking up in a strange place with no idea where she is or how she got there. The tone is similar, as well. There’s even a hatter who acts quite mad. I absolutely love the humor. While Year Walk had a few scares and not much humor, Device 6 is loaded with dark humor and absurdity. And the protagonist is aware of the absurdity of her situation. We know this because we see her thoughts alongside her actions. She’s no idiot, even if the game thinks you’re one. My only real complaints about the game are lack of iCloud saves and lack of saves mid-chapter. If I got stumped on one of the puzzles and the game got wiped from my phone’s memory, I had to start the chapter over. The chapters are fairly short with only a few puzzles each, so it’s not the end of the world. But it meant I was rushing through the game more than I would have liked to. 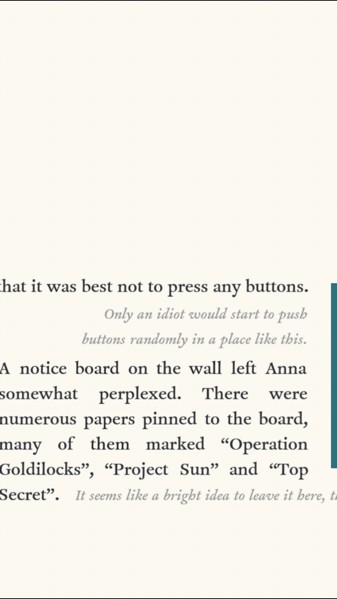 For a mobile game — especially one designed specifically around mobile devices — it really should have a way to save mid-chapter. It would have allowed me to relax more and take a break when I was getting frustrated. But having to start from scratch just because I was stuck on the final puzzle of the chapter made me more likely to ask for hints than if it saved my exact place. Also, it would have been nice to have all the chapters unlocked when the game is completed, allowing any chapter to be replayed. Instead, your only choice if you want to revisit a part of the game is to restart from the beginning. I had this same complaint about Year Walk, because there were so many little things I would love to have permanently unlocked so I can play with them whenever I wish. It’s not a huge problem, just something I think would give both games lasting power and a reason to keep them on my devices. Another Simogo game, Sailor’s Dream, didn’t really do much for me. There wasn’t much substance. I would have liked some actual puzzles. But one thing I liked about it is that you can revisit any part of the game whenever you like. I would love to be able to do the same with Year Walk and Device 6 once completing the game, if for no other reason than to be able to whip it out and show a friend my favorite bits from it. Device 6 also made my hyper aware of the fact that most games we see on mobile devices are not really built around the devices’ strengths. I remember back when I first got my iPhone and I was giddy over the use of gyroscopic controls in one of the Antrim Escape games to shake a candy box to hear what’s inside. This was in a point-and-click adventure game and I’ve not seen too many games in the genre do something like that. Sure, there are straight-out puzzlers that focus in on one mechanic that wouldn’t work on any other platform. And we have a few amazing games like Monument Valley and The Room series. Or even DOOORS, which is a series of rooms without any words, but gives visual cues. You often need to shake or tilt your device to solve the puzzles and escape. But these are just a series of puzzles. They don’t weave together so seamlessly the way everything does in Device 6. Even a couple years later, there aren’t too many games that play to the device’s strengths as well as this game. Device 6 is one of those games that can only work on touch screen devices due to its heavy use of tilt controls. But it utilizes them the right way. I hate tilt controls when they’re meant to be used to precisely control a character or other mechanic, such as a labyrinth puzzle. In fact, Antrim Escape had some labyrinth games mixed in and I couldn’t stand those. But Device 6 highlights what an iPhone can do without getting all gimmicky or going overboard. It doesn’t feel contrived or forced. It feels natural. And I wish there were more developers out there who could (or would at least try to) capture the essence of these devices as masterfully as Simogo did here. There’s even that meta aspect of the game, where it acknowledges that you’re playing on a device. You as the player are part of the game at the same time as being outside of it. There’s this dichotomy that almost shouldn’t work, and yet it does. Simply put, Device 6 is one of the best reasons to own an iOS device. And if you have one, this game should be on it. And here is where my spoiler-free review ends. If you haven’t played Device 6 yet, I highly suggest you download it here. And now, I’d like to share some of my favorite parts of the game and why it worked so well. If you played the game already or simply don’t mind spoilers, continue ahead. Disclaimer: I didn’t do any research for this. I just wanted to get my own thoughts down on paper. 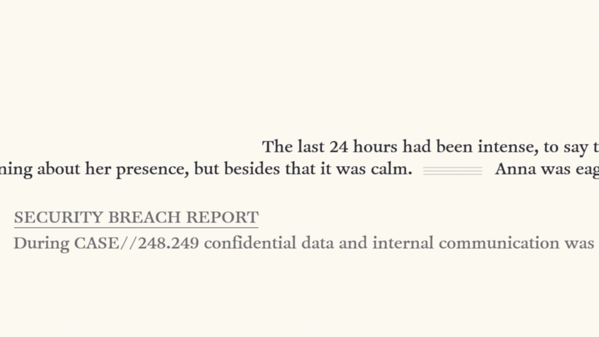 It’s possible (and probable) that there’s a lot of information out there already that explains things in more detail, perhaps even from Simogo themselves. But I just wanted to analyze certain parts of the game and why they worked so well for me. It was just so unexpected that it stopped me in my tracks. It was funny, but it also had just enough creepiness to it to be unnerving. I don’t know if he was talking to me, to Baby Bear, to Anna, or even to Goldilocks. And I think that’s the point. It could easily be any of those. But just listen to it. So perfect. There’s another part where Anna comes across a (mad) hatter down a well and offers to go find some help. He, in turn, asks if she needs help. After some back and forth, Anna finally gives up and moves on. She’s not an idiot, after all. She knows she has to take care of herself and not waste time with this lunacy. She offered her help. 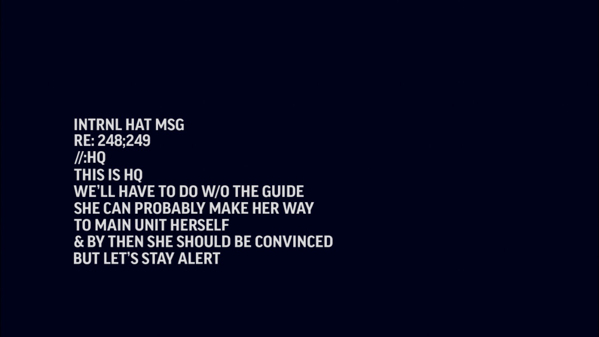 She’s not going to be that dumb hero that risks everything to save someone who doesn’t want to be saved. 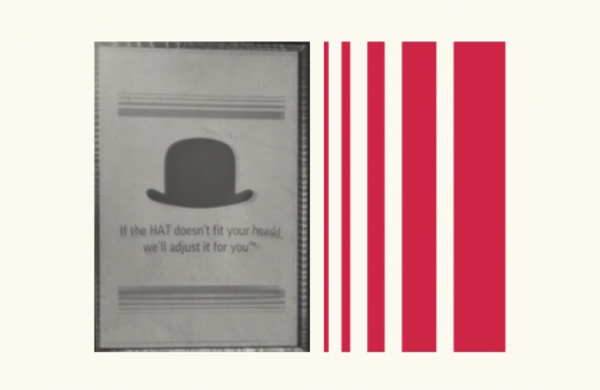 Another fun line was “If the HAT doesn’t fit your head, we’ll adjust it for you.” Even though it’s never expanded upon, I assume they meant they would adjust your head, not the hat. It’s subtle, but captures the essence of the game so nicely. Stylistically, I’m sure it comes at no surprise that the spiral staircase stands out to me. But even more so, I like the hidden areas that only appear after you explore other rooms. Backtracking becomes a big part of this game, but not in an annoying way like in many adventure games. My absolute favorite puzzle was the backwards recording that had to be listened to while in the room where everything was reflected. If you listened to the recording anywhere else, it just sounded like gibberish. But in that one little section of the game, it gave you the clues to one of the puzzles. Absolute genius. I remember specifically thinking “that sounds like it’s being played backwards.” But it took a really long time for me to get from that thought to the point where I was playing that channel while in the mirrored room. Without any hints, some people might get that right away, while others might stumble upon it by accident. The Three Bears was also a great puzzle because they all had essentially the same voice and you had to truly listen to their words to determine who was talking. The order in which you activate them also affects what they say, so it’s possible to miss important information if you rush through this part. It’s also a puzzle that you can’t rush through. The game simply won’t allow it. You have to slow down. Another great example of the logical yet tricky nature of the puzzles in the game is the men’s room password. I loved that one of the clues that points you in the right direction is partially cut off, so you’re not 100% sure it’s important. It makes you wonder if you’re looking in the wrong place after all. I knew that already. I saw the clue that surveillance routes must go in straight lines. But they all go in straight lines! How does that help me?! To make my point about what an awful hint that is, I took a screenshot and started drawing on one of them to show him the straight lines…and then I saw a “4.” And I laughed. I could have solved the puzzle hours ago had I just taken out some pen and paper. But I was looking at the puzzle the wrong way. It was so much simpler than I imagined. And that’s why I love it. To me, the Venetian mask puzzle was one of the weakest. Having a piece of wearable equipment that reveals hidden things is a cool effect. But it’s something I’ve seen done in plenty of games by now, so it didn’t feel as groundbreaking as something like the backwards audio recording. It seems like something that was used out of obligation rather than innovation. But even if I think it’s one of the less creative puzzles in the game, the clues given were more cryptic than simply “turn on the mask to see them,” so it still had me scratching my head for a while before I figured out the solution. It just wasn’t as unique as the others. Overall, the puzzles were solid from start to finish. I really can’t complain about any of them. I want to talk a bit about the surveys. They could have made those mean something, maybe different answers gave you different points — maybe even randomized. Could that have been an interesting route to take? Sure. But I liked that the first survey has you questioning whether your answers mean anything, yet by the next chapter’s survey you’ve already decided it’s all bogus. It keeps in line with the almost mocking tone of the game. It also fits well into the idea that this is all just a big test and you’re being messed with. Questions are answered in the last couple of chapters, but the ending is ambiguous. 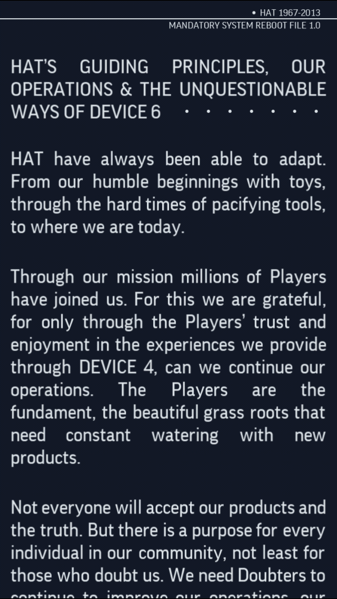 Device 6 and the organization called HAT are explained. Or so you think. There are several possible explanations, but I don’t think we can really determine which one is the intended meaning. I’ll touch upon some of my own thoughts and questions, but I don’t want to try to explain it away. I like the ambiguity. We are led to believe that we overheard some communications from HQ (Headquarters). Then, shortly after, Anna is shown Device 6 and she turns the power off. We are then shown an explanation of HAT, Device 6, and the role of Players and Doubters. 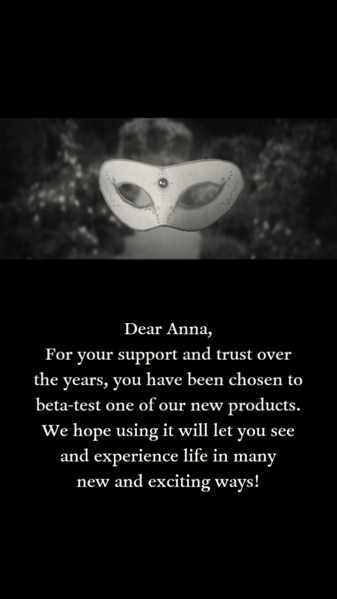 Anna is a Doubter, while we are Players. At least, according to what we’re being told. Shortly after that, we see that HAT was not too happy that their communications and other information got through to Device 4 (which seems to be the device we’re using as Player 249). We see one of them coming towards us/Anna on the dock, holding a gun up to our faces, and then there’s blood. Is it our (Player 249’s) blood or Anna’s blood? Did Anna get away with a happy ending and the sun on her face and we got killed or did we get Anna killed? Again, I don’t think we can answer these questions. It’s all a simulation, and there’s no way to tell what we were supposed to see and what we weren’t. How much of all this was a test for Player 249? How much of it was real? I think all these questions are what make this more than just a great puzzle game, but a powerful experience that will stick with you and make you think about it every once in a while. It’s also a great reflection on how much our devices have become part of us. If you’re stuck on any of the puzzles, try my step-by-step walkthrough. Agreed! I liked he linearity, especially when I realized early on that our choices were merely an illusion. Its not nice to make a Text based game, that tells the deaf that “this game is only for the hearing so go away”. 😛 I thought my friend might like the game right up until I found out that some clues are for hearing people only. Oh well.